You’ve spent hours researching numerous different computers. Checked and compared all their specifications and finally settled on a system unit that can do the job, but now you need a monitor and you’re starting to get close to the top end of your budget. But don’t worry, as this is where we come in. We’ve researched an array of different monitors that are all under the $200 price tag. So whether it’s for gaming, media editing, or simply browsing the web, if you’re after a fantastic monitor that won’t break the bank, you’ve came to the right place. During our extensive studies we found some really great budget monitors but after thoughtful deliberation we’ve chosen the ASUS VE278H as the best monitor you can purchase for under $200. We’ve chosen the VE278H, due to how great of an all-round monitor it is. As whether it’s gaming,web browsing and everything in between, the ASUS VE278H will perform to a very high level and consistent level. 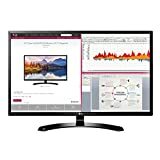 Before we even started looking at monitors to test out, we needed to uncover, what it is that users look for in a computer display. Now there is an incredibly large number of potential monitor users out there, with a variety of different objectives and goals. Whether it’s gamers who need a quick monitor response time or aspiring developers who need a nice mixture of features. Due to this range of users, we’ve had to extensively survey many individuals from numerous different professions and backgrounds. So that we were able to create an accurate range of potential features that people look for in a monitor. From this research we were able to construct this list of the 5 most important aspects that people need in a good computer display. We determined this final list by using the above features as criteria for deciding which monitors to test out. Once we had narrowed our list of potential candidates down to 5, it was time to get them into the office, so we could try them out for ourselves. To accurately test each display we had to spend considerable time, undertaking a variety of difficult boring tasks. Such as, watching films, gaming and browsing through our favorite websites. So that we could determine which one was the best. And even though we lost a few testers along the way, we managed it. Our testing phase began the second we got the monitors out of the box, so we could check the physical build of them and also study picture quality and performance over an extended period to make sure they were up to the task. All of the monitors that made it through, to our final 5, were extremely proficient in each of the categories listed above. Our surveyed users decided that the most important feature to take into consideration was the picture quality. Whether it was for watching films, gaming or doing word processing, having a good quality picture was important to them all. But how exactly does one measure the picture quality? Panel Type – While most computer displays around these days are based on LCD technology, they are not all on the same level, as LCD monitors can be separated into different categories. Eg. IPS panels which can provide wider viewing angles and fantastic colors. TN panels that tend to have low response times but sacrifice color quality or the VA panel, which is a good all-rounder. So we decided to take the panel type of each monitor into consideration when studying the image quality of each. Viewing Angle – This is the maximum angle that the image can be viewed at, while still providing a satisfactory viewing experience. Contrast Ratio – Which is the difference between the brightest and darkest images a screen can show. So the better the contrast ratio the higher the ability to achieve more realistic images is. Along with the above attributes we also simply used our eyes to decide which display we believed gave the better image quality, as while stats are great to have, nothing beats experiencing the product, first hand. The actual physical build of each monitor display was another important feature that our users wanted to see tested. As no one wants a monitor that’s going to look average next to that fancy new computer you’ve just bought. So while we did undertaken, a sort of, computer monitor beauty pageant to debate the aesthetics of each display, we also took into account a few other features in this category. For instance, the durability of the monitors was tested. Now we understand that the chances of a monitor being moved on a daily basis is rather small but we felt that checking, to at least see how stable each display felt when placed on a desk, was a very valid test. We also examined the ability of each display to swivel and pivot, as the more freedom to set the unit to exactly how we want it, the better right? There are many different types of monitors available today and they come in an array of screen sizes, which range from 19” all the way to over 29”. Now while external factors such as the amount of physical space that you have available, will hold some bearing over which screen size you opt to go for, our surveyed users did have a preferred option. So we’ve taken this into account as well while analyzing our picks. Another aspect of the screen, which needs to be taken into consideration, is the screen resolution, which is essentially the number of pixels that can be displayed on the screen at any one time and can be an important factor in the quality of a display. Finally we’ve also chosen to examine the bezel of each screen in this section as well. As many gamers or designers have suggested that they prefer monitors as little a bezel as possible. This category is for the gamers among us. As monitor performance can make a massive difference to your gameplay experience and in-game success, it won’t turn you into an e-sports champion but it can make a difference. The two main aspects that we covered in this section were the refresh time and the response time of each display. Firstly the refresh time (in Hz) is how often the screen refreshes the display. A higher refresh rate means less screen flicker ( in CRT displays), which creates a more enjoyable experience. In LCD displays, the refresh rate dictates the number of times per second in which data is drawn on the screen. So while a LCD won’t suffer from the screen flickering of CRT units, they can have a refresh rate, which is too high. To counter this problem some monitors have built in features that allow them to change their refresh rate to fit their current scenario e.g. FreeSync. So we noted which monitors provided this feature as well. Secondly the response time of each monitor was studied. The response time of a display is how quickly that monitor can change a pixel’s color from one shade to another. The lower the response time, the faster this color change will occur and therefore the more fluid the image. So we were really looking for monitors that had acceptable response time, as any display with a poor response rate, is more than likely going to be prone to “ghosting”. Ghosting is a trail of pixels that haven’t managed to change quickly enough behind a moving object. It can look extremely poor and can easily ruin a gameplay experience. So while the features related to gaming might not be important to everyone, they definitely had to be taken into consideration. Lastly we studied the additional features that each monitor brought to the table. This took into account characteristics such as, the types of input ports each display had. Here we were looking for digital inputs such as HDMI and DVI rather than say, a VGA, which is an older form of display input. We also looked at the number of input ports that were available. As extra ports can give users options to connect additional hardware, for instance, a games console. Other features such as whether or not the screen was anti-glare or how good the units built in speakers, were also examined. After long and thoughtful consideration, we have decided to choose the ASUS VE278H as our champion monitor, which you can buy for under $200. ASUS is a brand consistently held in high regard within the computer hardware industry and that is proven to be the case here as well. The VE278H ticked the majority, if not all of the right boxes, for the aspects we were looking for. With great picture quality, fantastic gaming performance and a solid build, we were very impressed with what we found. The ASUS has a 27-inch screen full HD resolution anti glare display and it looks brilliant. The monitor does use a TN panel, which may not display an image quite as good as some monitors fitted with IPS panels but that shouldn’t be a problem here. The VE278H displays extremely detailed images, fantastic colors and to make matters even better we encountered absolutely no display problems such as backlight bleeding, due to the ASUS’s impressive contrast and brightness levels. The gaming performance of the VE278H was another aspect that this display excelled in. As the 2ms response rate kept objects flowing smoothly and we experienced no ghosting during our playtime with it. The VE278H is also a very nice looking display, it may not win any awards for innovative design and while you don’t have the ability to swivel or adjust the height, it’s glossy bezel and solid stand mean that it won’t let you down in the cosmetic or physical departments either. The ASUS does have two HDMI ports and a VGA input but sadly no DVI. It also has built in speakers but their quality can be described as ‘passable’ at best. Other small elements that we felt were questionable are the positioning of the monitors buttons and the hard to navigate menu screens, but these are minor issues. 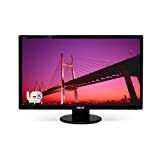 So apart from a few slight flaws the ASUS VE278H is a great all-round monitor, that you should definitely consider purchasing if you are looking for a computer display under $200. The second best monitor we reviewed was the Viewsonic VX275-MHD, which similar to the ASUS VE278H, turned out to be a very good all-round display with only a few minor faults. Firstly the picture quality of the VX2757 is very good, with excellent brightness output and accurate colors. We also noticed no color bleeding or other pixel related issues during our testing phase but were slightly disappointed with the below average viewing angles. The VX2757-MHD also gave us a fantastic gamer experience as due to it 2ms response time and low-input lag, we experienced no ghosting or gameplay issues. 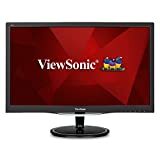 The Viewsonic’s build quality however felt quite poor, got dirty easily and the stand did wobble quite considerably more than the other displays we tested. It also had awkwardly placed buttons and again similar to the majority of monitors, had poor speakers. 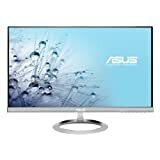 So while the VX275-MHD is a very acceptable choice, if you’re after a computer display for less than $200, it’s not up to the same standards at the ASUS VE278H. The LG 32MA68HY, has a screen size of 32”, making it the biggest display on our list. The 32MA68HY is also a very aesthetically pleasing monitor, complete with a thin compact design and a very sturdy build. The only real downside in terms of its physical build is that it has no swivel or height adjustment feature. In terms of picture quality the LG has extremely vibrant colors and razor sharp contrast, due to the IPS panel it contains, which allow it to display truly breathtaking images. The LG does contain a pretty handy USB port, along with the standard HDMI and VGA, but again no DVI. The only real downside we noticed was that the 32MA68HY seemed to not look as sharp when displaying text, which is a consideration you should take into account. The next entry on our list is the Samsung CF390. The CF390 has a 24-inch 1800R curved screen and while it is a fairly beefy display, it still looks very nice. Quality wise the CF-390 delivers a fantastic image due to its more than acceptable contrast ratio, which results in deeper blacks, brighter whites and an overall better picture. The included eye saver technology also reduces the amount of screen flickering, thus giving users less eyestrain. So if you’re going to be looking at your display for a considerable length of time this is a massive bonus. Performance-wise the Samsung CF-390 does fairly well, with its 4ms response time and 60Hz refresh rate. We did however find a few occasions when playing certain games it didn’t run as smooth as we would have liked. It’s also worth noting that while the CF390 does come with a HDMI and VGA port, it doesn’t come with any built in speakers, so you will have to purchase them separately. The MX279H is another ASUS display that made our list. This 25-inch monitor looks absolutely beautiful, with its frameless design and lightweight build; it’s definitely the best looking display in our top 5 picks. Unfortunately this amazing aesthetic comes at a price, as the display wasn’t as stable as we would have liked and featured no swivel or height adjustment options. This ASUS model does actually feature an IPS panel but we did occasionally notice slight color bleeding during our time with it, which was a shame to see considering how good the VE278H model was. The MX279H does feature a satisfying response rate at 5ms and is easily capable of undertaking your gaming needs, as we experienced no issues during our gaming sessions. Surprisingly the MX259H features a decent pair of speakers, 2 HDMI ports and the nice addition of touch sensitive buttons but sadly has no USB connection or DVI input. The ASUS MX259H is without a doubt one of the best looking monitors we have ever seen, it’s a shame that it’s viewing performance isn’t on that same level. With it’s remarkable picture quality and gaming performance capabilities, combined with an impressive build quality, we had to crown the ASUS VE278H the winner. While the other displays we tested were all fantastic in their own right, with many impressive features, such as the Samsung CF390’s curved screen and the Viewsonic VX275-MHD’s gaming performance. They just didn’t match the great overall experience of the VE2728H. So if it’s a fantastic all-round monitor you are after for less than $200, you can’t do wrong with the ASUS VE2728H. It might seem like a budget price range, but there are plenty of great options under $200. We review and rate the Best Monitors under $200 this year.